If you are in the area.. Come visit our nursery in Lindsay CA year round; just give us a call ahead of time and we will show you our display Beds and gift shop. If you are in the Home of Flemings Flower Fields, Lincoln NE, please visit 'Fleming Fields' which was dedicated by the University of NE-Lincoln to the Fleming Brothers at the site of their old nursery 35th and Leighton. 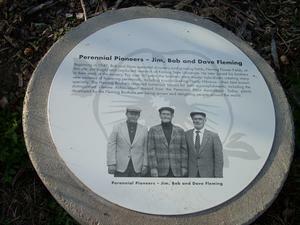 Dedication Plaque at Flemings Fields in Lincoln NE near UNL East Campus.